The pilgrimage season at St Patrick’s Purgatory, “where the needs of the body are disregarded and the yearnings of the spirit are addressed”, started this weekend and will continue until Tuesday 15 August. Famous in medieval times as Europe’s toughest pilgrimage, the three-day retreat is still a major feat of endurance. Pilgrims are expected to fast from midnight before they arrive on the station island. 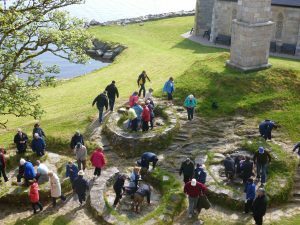 Once on St Patrick’s Isle, they remain barefoot while completing a cycle of prayer and liturgies involving visiting designated stations and reciting set prayers. On their first day, they are also required to remain awake for 24 hours, and on their second and third days they partake in only a light meal of black tea and unbuttered toast. Pilgrims have been coming to the island in Co. Donegal for some 1,500 years, and Lough Derg has an enduring popularity. These days, about 8,000 people a year complete the three-day pilgrimages, but hundreds more also participate in special days such as the ‘Family Day’ on Friday 18 August, ‘Quiet Days’ in May and on Friday 1 September and a ‘Living with Suicide’ retreat on Saturday 30 September. At a Mass marking the start of the three-day pilgrimage season, Mons Joseph McGuinness, Administrator of the Clogher Diocese, made reference to some of the folklore about the island. “One of the many legends which surround this ancient and sacred island of pilgrimage relates to the meaning of its name – Lough Derg,” the Monsignor said. “It is said that the name comes from the Irish Loch Dearg, meaning the ‘Red Lake’, because Saint Patrick, when he came to the lake, struggled against a fearsome monster that lived in its waters. Saint Patrick, having already dealt successfully with the entire national snake population, wasn’t to be bested by a water monster and it was duly slain. The waters of the lake were stained with its blood, and hence the ‘Red Lake’. “Nowadays the waters may appear more grey than red, but the image of struggle which the story presents is no less real. For centuries hundreds of thousands of people have come to this place to struggle with the challenges of hunger, sleeplessness and physical penance. Mons McGuinness continued: “What this place bears witness to is the need for healing and hope in a wounded and broken world. From the mass horrors of war to the intimate hurts of our own hearts, the need for gifts of mercy, forgiveness, human empathy and generous love is unending. For more information see: www.loughderg.org.